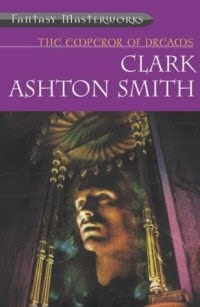 Entitled The Emperor of Dreams, Fantasy Masterworks 26 compiles forty-four of Clark Ashton Smith’s (1893-1961) short stories, book-ended by a short essay of Smith’s entitled ‘On Fantasy’ together with his poem ‘Song of the Necromancer’, and an excellent concluding afterword by Stephen Jones. A much-vaunted friend and contemporary of H.P. Lovecraft and Robert E. Howard, Smith attained a contemporary cult following through the publication of his short prose in pulp titles such as Weird Tales. His rich, decadent writing has continued to seduce admirers of speculative fiction since he abandoned its composition in the mid-1930s. I read this Fantasy Masterworks collection intermittently over the space of six months or so. The cumulative effects of Smith’s obsessive repetition of certain tropes (omnipotent, deranged necromancers; exotic near-eastern locales; unknown terrain within familiar locales; the mastering of protagonists' volition, and their subsequent unwilling actions) have a certain narcotic quality. They’re too potent to consume in excess over a short period of time; too addictive to leave aside indefinitely. Previously unencountered, unfamiliar zones within otherwise well-known areas are something of an obsession in Smith's work. His characters frequently find themselves within ‘a clueless maze of unreality, of deception and dubiety, where nothing [is] normal or familiar or legitimate.’ (p. 93). Similarly, readers quickly learn not to be surprised when a protagonist declaims ‘somehow, in that deceptive fog, I managed to lose my way, to miss the mile-post that would have given me my direction to the town where I had planned to spend the ensuing night.’ (p. 110). Characters are frequent symbolically as well as topographically disorientated: “I must find my kingdom[...] I am lost in darkness, amid uncouth things, and how I have wandered here I can not remember.” (p. 320); ‘At last he found the switch; but the illumination that responded was somehow dim and insufficient.’ (p. 375). There is more than a mere gloss of antipathy to worldly wealth in Smith’s writing, possibly precipitated by his own precarious financial circumstances (which are well-detailed in Jones’ afterword), or perhaps engendered by an overarching belief in the futility of the pursuit of money in light of the eternity of nothingness that awaits outaide his imaginary environs, and beyond his and his readers’ lives. The gory end appointed to the prosperous victims of the Ghorii is a case in point: ‘They and their drivers were buried from sight by the ravenous monsters, who began to devour them immediately. Boxes of jewels and bales of rich fabrics were torn open in the melee, jasper and onyx idols were strewn ignominiously in the dust, pearls and rubies, unheeded, lay weltering in puddled blood; for these things were of no value to the Ghorii.’ (p. 285). Characters and races we encounter elsewhere in the collection who express as interest in the pursuit of financial gain are neither well-regarded nor likely to be granted a felicitous destiny by their creator: ‘This people, it seemed, were most regrettably materialistic and had long ceased to offer sacrifice and prayer to the gods; though they spoke of them with a sort of distant respect and no actual blasphemy’ (p. 80). A work which both invites and repays rereading, The Emperor of Dreams is an excellent addition to the Fantasy Masterworks series.